Welcome to my website. I hope you will enjoy looking around the various sections to find out more about me and my books and other writing work. I love hearing from readers so please feel free to contact me if you have any questions, would like me to visit your book group or run a creative writing workshop. I write non-fiction – both full length and features for a variety of publications – fiction and poetry. I enjoy working in collaboration with artists from other art forms and have worked on projects with print maker and visual artist Silvana McLean and sculptor Matt Baker. I have also enjoyed working on a number of community-based oral history projects and exhibitions for Dumfries and Galloway Women's Forum, Community Learning and Development, Poverty Alliance and the National Theatre of Scotland's inaugural 'Home' project. My novel No More Mulberries, set in Afghanistan, was published in 2009 and is available in both paperback and eBook formats. Drunk Chickens and Burnt Macaroni: Real Stories of Afghan Women (Indigo Dreams Publishing) is a non-fiction account of my time in Afghanistan and provides a unique insight into the lives of Afghan women before and immediately after Taliban's rise to power. My poems have been published in a variety of literary magazines and anthologies and my first full length poetry collection, Thousands Pass Here Every Day was published in 2012 by Indigo Dreams Publishing. As the summer ends and autumn approaches the diary is filling up. Events coming up include a poetry reading – along with writers Vivien Jones and JoAnne McKay – on Wednesday August 21 in Carlisle, Cumbria at the LitCaff @ Merienda, Treasury Court. We’ll be reading a selection of poems about places – both home and away. Saturday September 7 and it’s off to Melrose to Abbotsford, home of Sir Walter Scott to perform in Red Rose White Rose at 7pm. The house has recently re-opened after a major programme of repair and refurbishment. We will be performing in the stunning setting of the library with Sir Walter Scot’s 7,000 books which remain just as he arranged them on the shelves. On Thursday, September 19 I’ll be swapping poetry and drama hats for my narrative non-fiction one when I give a talk/reading from Drunk Chickens and Burnt Macaroni: Real Stories of Afghan Women at Atkinson-Pryce bookshop in Biggar, South Lanarkshire. Atkinson-Pryce is an excellent example of that distressingly rare breed of independent book shops and has a growing reputation well beyond the borders of Biggar. Booking details here. Weekend Writing Course: Following the success of our earlier writing course, Margaret Elphinstone and I are teaming up to run another creative writing course. This one is from Friday, October 18 to Sunday October 20 and the venue is once again in Juliet and Alan’s wonderful Durhamhill in the village of Kirkpatrick Durham, south west Scotland. Click here for more information on the course – the tutors, the content and booking information. A number of places have already been booked so if you’d like to attend don’t delay. I was delighted when Lesley Duncan, the poetry editor of The Herald, Scotland’s top daily newspaper selected a poem from my collection for her Poem of the Day column. Lost in Translation is in Thousands Pass Here Every Day. 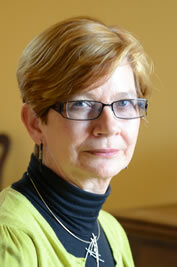 I am delighted to have been interviewed – via skype – by Canada-based author Carolyn Steele. Not only did she read and post an excellent review of Drunk Chickens and Burnt Macaroni she then interviewed me for her podcast. You can read her review here and listen to the interview here. Carolyn has written two excellent narrative non-fiction books. Trucking in English is the story of how Carolyn, a Brit now living in Canada, learned to drive trucks – really big trucks – across the Canada and America. It’s a fascinating account and gripped me from the opening pages and truly I was not a person interested in trucks and trucking! Her other book, A Year on Planet Alzheimer: and a little longer in Canada is about how she came to live in Canada, looking after an old lady with Alzheimer. I can highly recommend both. Red Rose-White Rose is still touring. This is a wonderful combination of scripted drama and music. The script, based on one of her short stories, is by writer and musician Vivien Jones who, along with Richard Jones play glorious 16th music on traditional instruments. Set shortly before the Battle of Flodden, Red Rose-White Rose tells the story of two women in the life of James IV – his queen and his mistress. I’m the mistress! 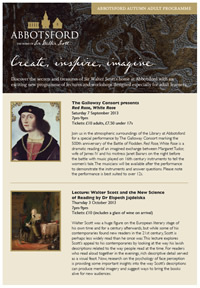 Our next performance is at the newly refurbished Abbotsford House, Melrose, home of Sir Walter Scott. Perhaps nowhere else in the world can evoke the power of the romantic past more than Abbotsford, stunningly located on the banks of the River Tweed in the Scottish Borders. Abbotsford sits at the heart of the landscape that inspired the poetry and novels of its creator, Sir Walter Scott. Unlike the homes of other great writers, this is a house that the writer himself designed and as such uniquely embodies a physical representation of the Romantic Movement that he helped to create. When you touch the bricks and mortar of Abbotsford, you are touching the soul of Scott. It’s going to be a glorious setting for our performance on Saturday, September 7. More information here. Drunk Chickens and Burnt Macaroni: Real Stories of Afghan Women did not win the non-fiction category of The People’s Book Prize but it did reach the top three, which I guess isn’t bad at all – and I attended the awards evening held in the splendid Stationers’ Hall, London. This is the home of the Worshipful Company of Stationers and Newspaper Makers so quite a fitting venue for a journalist! Many thanks to all those who managed to circumnavigate the rather labyrinthine voting system. Great excitement at Drunk Chickens and Burnt Macaroni: Real Stories of Afghan Women being shortlisted for The People’s Book Prize in the non-fiction category. Many thanks to those of you who voted for it in the previous rounds – and please can you vote for it again? If you were one of those who kindly voted in a previous round you just need to enter the letters shown on the coloured background, your email address (twice!) and the password you used when you voted before. If you cannot remember the password, guess it and if you are wrong it will give you the option of having it emailed to you. If you haven’t vote before you must first click on the word “register” and you will find a short form to fill in after which they will immediately send you a password and then you can vote as in the paragraph above. The voting closes at 10am on Wednesday, May 29. I’ll be in London for the award ceremony that evening – feeling very nervous and excited. There are lots of exciting things going in the diary already this year. Still time to vote for Drunk Chickens and Burnt Macaroni in the People’s Prize book award! 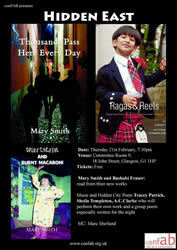 On February 21 I’ll be in Glasgow for an event called Hidden East, the joint launch of my latest book, Drunk Chickens and Burnt Macaroni: Real Stories of Afghan Women, along with Bashabi Fraser whose latest publication Ragas and Reels, which offers an insight into the fusion of Eastern and Western cultures in Scotland today. Organised by conFAB, there’s a great line-up of other writers who have written a specially commissioned group poem for the evening. Rupinder Dulay has invited me back to the Nail Factory, her gallery in Dalbeattie, south west Scotland where I did a couple of poetry readings last year. This time it’s for an Afghan evening. I’ll be reading from Drunk Chickens and Burnt Macaroni and bringing along some artifacts and images from Afghanistan. The event is on Saturday, March 9. I am delighted to be tutoring a residential creative writing workshop with Margaret Elphinstone, one of Scotland’s leading writers. This will be held from March 25 to March 29 at Durham Hill, Kirkpatrick Durham in southwest Scotland. The stunning setting is guaranteed to get the creative juices flowing: glorious landscape, great accommodation – and even llamas in the field. The course is suitable for writers at all levels. Red Rose-White Rose has been booked for further performances. We will be at Paxton Hall in the Scottish Borders on May 5 and Wigtown Book Town Spring Book Festival on May 6. I’ll also be appearing at The Old Bank bookshop in Wigtown on May 4th with Drunk Chickens and Burnt Macaroni. I’m very excited about my book Drunk Chickens and Burnt Macaroni: Real Stories of Afghan Women being nominated in The People’s Book Prize in the non-fiction category. Rather than a panel of judges, the winner is chosen by public vote. You can vote here on The People’s Prize website where you can also download a short extract from the book. I hope you will take a look and vote for Drunk Chickens and Burnt Macaroni. Voting is open until February 28. My book is up against some tough competition so every vote counts and it would be fantastic if a book from Indigo Dreams Publishing, which is a small independent publisher, won a prize. In a total departure from the kind of thing with which I usually become involved I have been performing in Red Rose-White Rose, a wonderful combination of scripted drama and music. The script is by writer and musician Vivien Jones who, along with Richard Jones play glorious 16th music on traditional instruments. Set shortly before the Battle of Flodden, Red Rose-White Rose tells the story of two women in the life of James IV – his queen and his mistress. We’ve been playing to sell-out audiences in Dumfries & Galloway. You can read more here. 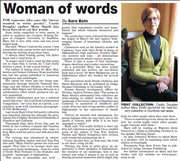 Woman of words for someone who says she "never wanted to write poetry", Castle Douglas author Mary Smith has been forced to eat her words. 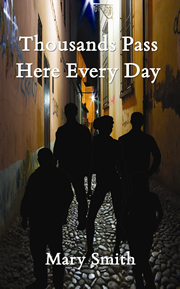 I am delighted to announce my first full length poetry collection, Thousands Pass Here Every Day, has been published this month (September 2012) by Indigo Dreams. I am very honoured three wonderful poets provided some lovely comments for the back of the book after reading the collection. My diary is now being filled for the next few months with a series of launch events and readings taking place throughout south west Scotland from Wigtown to Sanquhar. I am also taking part in a shared launch in Glasgow in November at the Scottish Writers’ Centre. I’m happy to do readings to book groups/writing groups so do get in touch if you would like to book a visit. Thousands Pass Here Every Day can be purchased directly from the publisher’s online bookshop or from Amazon as well as bookshops. If it is not in stock ask them to order it! Look out for more news coming soon about the publication of a narrative non-fiction title.